Chewing Gum malayalam movie scripted and directed by debutant Praveen M Sukumaran stars Sunny Wayne and Thinkal Bhal in the lead roles. Ready for release in April, Chewing Gum has already created a huge buzz with its innovative treatment. M R Gopakumar, Baiju Ezhupunna, Gopal, and Chinchu Mohan will be seen in important roles. Chewing Gum is produced by Sudeer M Sukumaran under the banner of Think Cinema. It seems that each young filmmaker is over ambitious to put signature touch on his own work. Just considering the recent released movies, we can understand how one is different from the other. Adding one more to the line of innovation, debutant Praveen M Sukumaran, who has scripted and directed the movie, is ready with his first creation "Chewing Gum" which tells the tale through an innovative way using video dairies for transferring messages and memories. Giving a unique treatment, Praveen has tried to walk the way less has travelled. Praveen being an alumnus of Satyajit Ray Film and Television Institute (SRFTI) has given a different approach to his first Malayalam movie, which zooms into the life of a village guy who later lands in the dream of cities. Young actor Sunny Wayne and Thinkal Bhal will play the lead characters. 'Chewing Gum' is a well crafted love story which is being unfolded under the backdrop of migrant labourers. Dinu (Sunny Wanye) is a poor young man who lives in a village engaged in welding works to earn his daily bread. Violet (Thinkal Bhal) a member of an NGO that works with migrant labourers arrives to his village to spend her vacation. His close association with her changes his thoughts and insight about life. During the stay in the village, Dinu and Violet become close friends. The long association brings them together as Dinu travels to the city to work there. Violet captures their personal moments with her handy-cam. The story gets developed through the video diaries which play an important role in the tale. The life and struggles of labourers of West Bengal and Bihar are being depicted in the background which adds more depth to their intense romance. Later as Dinu flies to Dubai the video diaries keep them close. As they meet after three years of separation, these video diaries play a crucial role towards the climax of the movie. Inspired by a real-life romance, 'Chewing Gum' would be stand different in means of its making. As explained by the director, the title of the movie represents exploitation, with regard to the case of migrant labourers. These people are easily exploited for their cheap and skilled labour. Praveen has included alumni and students of FTII and SRFTI among the crew members. Sakya Deb Choudhury (cinematographer), Renjith Kuzhur (editor) and Ajayan Adat (sound recordist) are the few. There will be two folk songs, one in Bengali and another Hindi. Praveen himself has written the lyrics while while the music is created by Jonathan Bruce, who had been a long associate with Jassie Gift. M R Gopakumar, Baiju Ezhupunna, Gopal, and Chinchu Mohan will be seen in important roles. 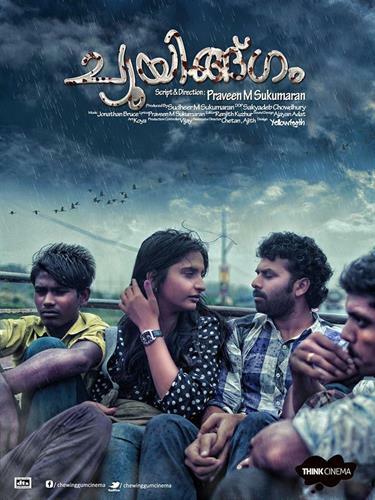 Chewing Gum is produced by Sudeer M Sukumaran under the banner of Think Cinema. Shot at locations in Ernakulam, Pallakad and Thrissur, Chewing Gum would reach theatres in the May 2013. So will the gum be worth for chewing? Wait for the first show in the theatres.